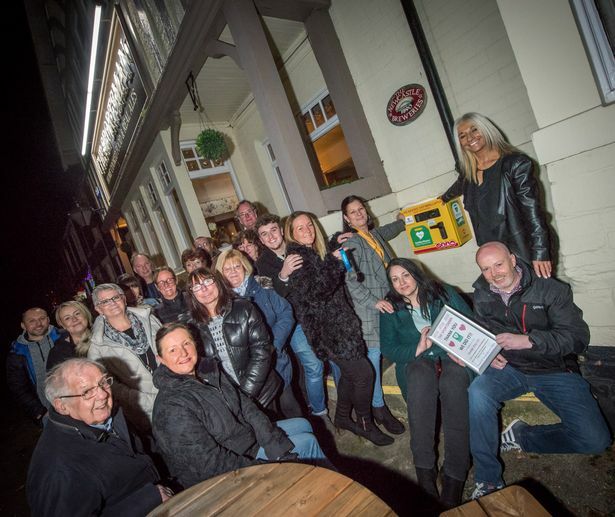 Simon Brown, of North Shields, has helped to unveil a new defibrillator at a pub and the equipment can now be used to help anyone who may suffer a cardiac arrest. A football coach whose life was saved by his colleagues after he suffered a cardiac arrest on the pitch is now helping to save others. Simon Brown, a coach for North Shields Juniors Under 18s, was playing football alongside young players and two other coaches at John Spence Community High School in December last year when he suddenly collapsed onto the field. He was given CPR at the scene by fellow coaches until an ambulance arrived and paramedics took over. A defibrillator at the school was used to help resuscitate him. Simon, of North Shields, spent 10 days in hospital and was released after a defibrillator was fitted in his chest. Now the dad has vowed to help other people whose life may be in danger. He has been working with The Sportsman pub in Preston Village and the charity North East Hearts with Goals to provide a 'public access' defibrillator at the site. The equipment has now been unveiled at the pub and can be used for all members of the community. The team says a chance conversation in the bar with staff and customers brought to light the fact there was no public access defibrillator in North Shields. New licensee Susan Sisterson and her staff put on tombolas and raffles with North East Hearts of Goals, raising £550 in a week. The remaining £1,000 came from Simon’s wife and son, Susan and Callum, who took part in The Great North Run. In addition, further funds will be donated to the charity to provide more defibrillators across the North East. Simon, 54, said: "I can’t overstate the amount of effort staff and customers put into raising money for the defibrillator. "I know from personal experience how important it is to have as many of these vital life savers in easily accessible places as possible. The Sportsman is the heart of the community, so it is fitting that the defibrillator should be located there." According to latest figures, sudden cardiac arrest is the UK’s biggest killer, claiming the lives of 100,000 people per year. North East Hearts with Goals, run by sisters-in-law Christine Stephenson and Kelly Best, has placed 400 defibrillators in the region over the last five years. Christine said: "Kelly and I have become great friends with Simon and look forward to working with him and the local community in placing more public access defibrillators. "Next year will be spent educating the public that anyone can use a defibrillator - you do not need to be trained and you cannot harm somebody with one. "We must dispel some of the myths about defibrillators and urge everyone to become more hands on." Ms. Sisterson, who took on The Sportsman in the summer, said it was a community effort to raise funds for the life-saving equipment. She added: "Like the rest of the village, I am thrilled we now have a defibrillator available should it ever be needed."